According to the Global Alliance for Buildings and Construction, buildings account for nearly 25% of all greenhouse gas (GHG) emissions worldwide. In Mexico, the World Resources Institute estimates that end-user energy consumption in buildings accounts for almost 20% of all end-user energy consumption in the country. Thus, energy efficient buildings will play a large role in Mexico's transition toward a clean energy economy and lower GHGs. As part of the activities developed since June of last year in support of Mexico's transition toward a clean energy economy, Berkeley Lab's Mexico Energy Initiative, in collaboration with Mexico's Energy Sustainability Fund (ESF), coordinated the participation of two experts from the Building Technology and Urban Systems Division (BTUS) in a week-long series of seminars on energy efficiency in buildings held last April in Mexico City. As a result of a Request for Proposals process, the Ministry of Energy in Mexico - National Council for Science and Technology ESF awarded resources to the Initiative for Education and Prosperity for Mexico, a consulting organization specializing in economic competitiveness, and the Technological Institute of Construction, the training arm of the influential Chamber of the Construction Industry in Mexico, to develop an energy efficiency training program for Mexican engineers, architects, and other building professionals with a focus on teaching best practices and increasing capacity in the sustainable construction area. 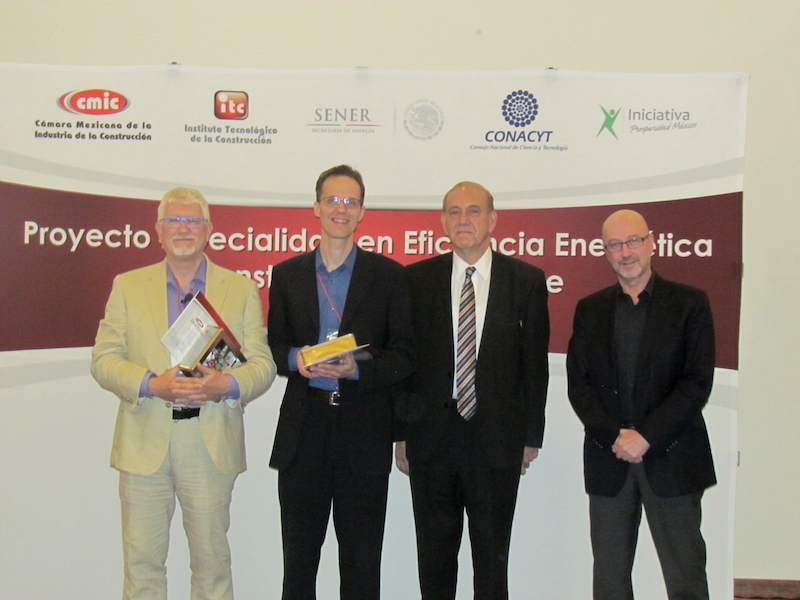 Christian Kohler and Philip Haves, two BTUS energy efficient building experts, joined other researchers from the California Lighting Technology Center at UC Davis and research centers in Europe in presenting the latest energy efficient building best practices and technologies to a large audience of Mexican building professionals. BTUS is the Berkeley Lab's Division that advances energy efficiency in the built environment through research, partnership programs and software tools. Kohler and Haves presented on topics including energy efficient treatments of façades, windows, and shading devices; the use of computer models to predict heat transfer and solar gain through façades including the use of state of the art Berkeley Lab-developed software tools; and practical design considerations and current trends. To address the energy efficient building systems, they also presented on whole-building computer simulation using the EnergyPlus program; high performing HVAC equipment and controls; and the use of radiant heating and cooling and natural ventilation. "The workshop's audience was a highly motivated group of teachers, architects, and engineers who are getting ready to teach the next generation of building professionals in Mexico about energy efficiency and sustainability. I really enjoyed interacting with the participants," reported Kohler. A second round of energy efficient building seminars are planned for October.